Poor dietary choices, lack of exercise and obesity are all issues that exist in communities across Australia. What many reports and studies have shown is that the rise of lifestyle-based disease like diabetes are often the result of poor food choices, an oversupply of fast food outlets and lack of exercise. The statistics are alarming and studies in South Australia recently revealed that more than a third of South Australians are overweight with recorded obesity rates higher than the national average. Not every city, town or community is fortunate enough to have a community hub and/or council that responds to issues such as these, but in The City of Playford in SA (and many other forward thinking councils we work with across Australia) steps are being actively taken to counter poor health issues. We believe that an important part of the change process is for councils to know and understand the problems that affect their communities. Problems that lead them towards obesity, diabetes and other lifestyle related health concerns. The City of Playford Council has taken active steps towards addressing these concerns. And by active we don’t mean reports and advice papers, but visible and tangible programmes in the community like Live Life Get Active free fitness camps and the affordable healthy food programme – the food co-op. Working with the City of Playford council was a true synergy – what Live Life Get Active represents and strives to achieve, melded perfectly with the City of Playford plan to rebrand and deliver improved quality of life in their region, with a particular focus on improved health. Amongst the programmes the City of Playford operates, is a food co-op that is dietician approved and sells bags of healthy food at a very cheap rate. These offerings are designed to allow households a fuss-free approach to making healthy meals for the whole family. At Live Life Get Active, we understand the pressures families face every day – escalating costs, a full and busy week, family demands and busy workloads. As a result of this pressure, we know that dinner and other meal preparation can suffer. After a long day at work and time spent commuting, many households have little time or tolerance to prepare dinner and this is where the allure of fast-food begins to take hold. So an initiative that gives people the tools (ingredients and recipes) they need to whip up a healthy and delicious meal for their families, is an initiative we want to support. Delivering a direct answer to the health issues and questions people have in terms of what’s ‘good’ to eat is where the City of Playford really steps up. Gone are ineffective pamphlets and flyers. In their place is a direct solution – the food you need to eat. It’s an initiative that cuts the bull and gives people what they need. Getting the Live Life Get Active camps up and running was a moment of immense pride for our team. Supported by the Mayor (who attended the opening) spreading the word about this successful partnership was top of mind. Take a look at this 9 News report about the new camps. 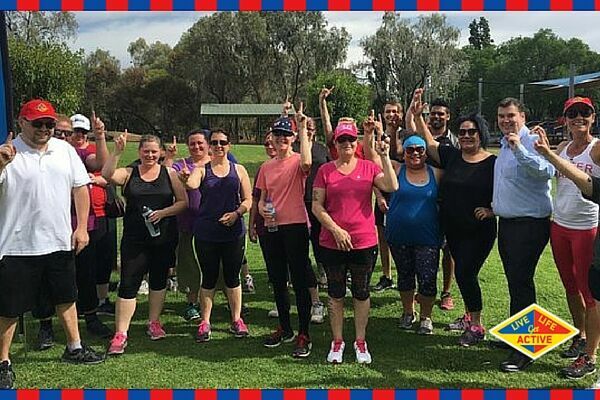 The team were strategic in their choice of an iconic park as the point to launch and run the City of Playford Live Life Get Active camp. It is close to schools, has a playground and is initially run at a time we felt would attract young mums. We would like to offer this to everyone so as we grow in SA we hope to have camps running at many different times. We have 5 camps and the times vary – 6.30am, 9.30am, 10am and 5.15pm. On our first day at Fermont Park 24 people registered to fill the available 27 places. A good result in anyone’s books and word of this camp has spread very quickly. We are now looking at two further sites as a result. On the other side of the ledger is nutrition and feeling confident to, and capable of, making good dietary choices that are ‘do-able’ for the whole family. At Live Life Get Active we can help change the way you eat. This makes it easier to make healthy choices. We offer a strategy to help you make positive changes that are both easy and affordable..
Live Life Get Active camps are a friendly alternative to the gym and the benefits are greater than the purely physical. Improved self-esteem is a key psychological benefit of regular physical activity, because exercise causes the body to release chemicals called endorphins that interact with the brain to reduce the perception of pain or sadness and trigger a positive feeling in the body. Live Life Get Active camps are designed to be fun, engaging, beneficial and life changing. We want to empower you to live a fit, healthy and happy life. And we make it simple by guiding you through effective exercise and nutrition strategies. If you want to help your community reach greater levels of health and well-being and are keen to set up a camp in your area, simply get in touch with us. 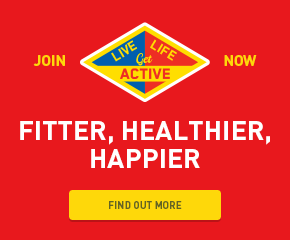 We are more than willing to help spread the Live Life Get Active word – so let’s have a chat.